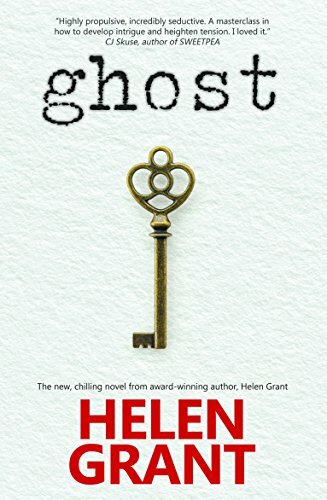 Helen Grant's latest novel, Ghost, captured my interest right from the very start. As the title suggests, it's a ghost story of sorts, but almost certainly not the kind of ghost story you're expecting. The Ghost of the title is really Augusta, a 17-year-old who lives at Langlands, a remote Perthshire mansion that's entirely off-grid. As we read on we discover that this isn't the full extent of Ghost's isolation: she lives with her grandmother, has never left Langlands' environs and, most importantly, has never met another human being. She can't leave Langlands, her grandmother says, because the Second World War is raging and she'd risk being called up to work in a munitions factory in a city or deployed in some other work towards to the war effort, so Ghost and her grandmother are mostly self-sufficient but for a few things Grandmother buys when she drives to the nearest town alone in her car. One day, Ghost hears a terrible noise in the night and fears a German bomb has finally hit the house - but in fact, a chimney has come down during a storm. It has to be fixed to stop Langlands from falling into irreparable decay, but this means, of course, that strangers will have to come to the house and Ghost will have to hide. But will Ghost, desperate for human company and fascinated by the very existence of other people, be able to bear to stay tucked away in the attic until the builder and his son Tom have gone? And if Tom does see Ghost, will he be able to keep the secret? I'd like to say more about the plot of this book, as it's a clever and constantly surprising one, but it's impossible to go further without straying into spoiler territory. What unfolds is a layered mystery with strong gothic undertones, a strong sense of sadness and psychological elements that take a dark turn. At more than one point while reading I realised this was not the book I thought it was going to be, and yet somehow nothing feels contrived; there are no twists that are there purely for their own sake. The story is told from the points of view of both Ghost and Tom, and both are convincingly written, particularly when we start to see the effect upon Ghost of her peculiar upbringing and subsequent traumas. This excellent read is an unusual book, part gothic tragedy, part romance, part mystery, part psychological thriller, and like all Helen Grant's books it has a strong sense of brooding atmosphere which I thoroughly enjoyed.